Brand: R.S.V.P. International,Inc. RSVP-TDB2 Units: 1 set / 3 pcs. 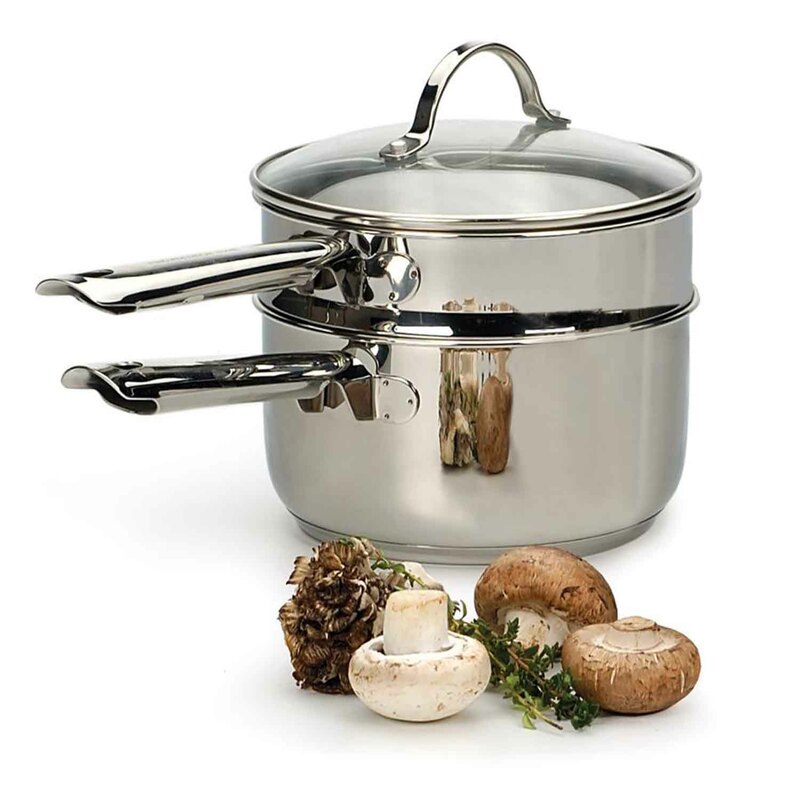 Total Stainless 2 quart double boiler. Top pan is designed with curved sides, allowing spatulas and whisks to glide smoothly for perfect blending. The bottom pan is a real workhorse, with a tough encapsulated base consisting of a thick aluminum core for quick even heat distribution. Both pans have 2-quart capacities, made of durable 18/10 stainless steel, and feature hygienic non-reactive cooking surfaces and polished exteriors. The fully tempered glass lid facilitates constant monitoring of delicate sauces, is oven safe to 450 degrees and fits either the upper or lower pan. All pieces are dishwasher safe. Stainless 2 quart double boiler. Top pan is designed with curved sides, allowing spatulas and whisks to glide smoothly for perfect blending. The bottom pan is a real workhorse, with a tough encapsulated base consisting of a thick aluminum core for quick even heat distribution. Both pans have 2-quart capacities, made of durable 18/10 stainless steel, and feature hygienic non-reactive cooking surfaces and polished exteriors. The fully tempered glass lid facilitates constant monitoring of delicate sauces, is oven safe to 450 degrees and fits either the upper or lower pan. All pieces are dishwasher safe.